Who Is Your Ebenezer Scrooge? One of my favorite new movies is the 2017 film, The Man Who Invented Christmas. The story depicts the writer’s journey of Charles Dickens (1812-1870) who created and published on December 19, 1843, his novella A Christmas Carol (Abridged Version), a timeless tale that would redefine Christmas as we know it. Despite Dickens’ personal situation: tight finances, his wife was pregnant with their fifth child, and disagreements with his publishers, he self published A Christmas Carol as a stand-alone book, doing it his way. Dickens’ first edition of 6,000 copies sold out by Christmas Eve and “overnight charitable giving soared” (per the movie credits) and, within a year the book had gone through 13 editions. But his decision to sell it at a low price coupled with its high cost meant it sold well, but it did not make much of a profit. 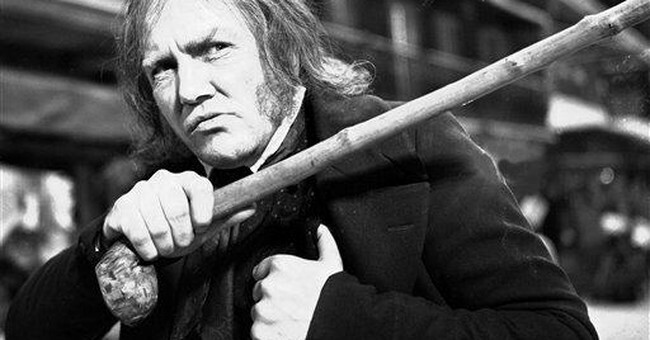 Dickens real-life poor business sense and profits contrasts somewhat with his character Ebenezer Scrooge being a business tightwad. Of interest is the name of his character, stingy and miserly businessman Ebenezer Scrooge. Ebenezer comes from 1 Samuel chapters 4-7 where Israel fights and loses to the Philistines. In chapter seven, Israel removes the foreign idols from their midst, repents and appeals to God, and win their battle against the Philistines. Samuel then sets up a stone and named it Ebenezer (1 Sam 7:12), “stone of help,” and the stone becomes a physical reminder of their repentance to the Lord and of His power and protection after returning to Him. The onomatopoeia works to describe the name Scrooge, “a blend of ‘scrouge’ the verb to squeeze or to press, used 1820-1830 (itself being a blend of crew and bruise) and gouge, an act of extortion, to swindle.” The combination of Ebenezer, “stone of help,” with his made up and coarse sounding name, “Scrooge,” and you get a good image of the person Ebenezer Scrooge. Dickens described a tight-fisted Scrooge as “grasping, covetous, hard as flint; secret and solitary as an oyster. The cold within him froze his old features, his pointed nose, his thin lips blue, and grated his voice.” Sort of giving the character the image of the walking dead. The same can be said when it comes to churches “equipping their saints for their work of service” (Eph 4:11-12)…especially in business. Some churches have begun to embrace the Lausanne Business As Mission (BAM) and other phrases (“transformational business,” “great commission companies,” and “kingdom business”) discussing faith and work. But a church’s BAM is more than starting a top-down church leadership funded and guided program or ministry or going on short-term mission trips to help third world countries with economic and business development. It does not matter how much or little one’s personal income or business revenue is, everyone has some type of income/revenue difficulties. Since everyone is having trouble, everyone could use some help to right their business ship, plug their cash flow holes, reverse their financial sinking, and then be able to do or give more for the Kingdom. So it would behoove churches to get on board with understanding business and economics and hold workshops and mentoring within the church to build Christian businesses up. Churchill’s quote about business fits right in line with some church or ministry attitudes that companies are nothing more than a cash cow to be milked for various ministry funds: “Some regard private enterprise as if it were a predatory tiger to be shot [Matt 19:24, rich man to enter heaven]. Others look upon it as a cow that they can milk [looking for “sacrificial giving”]. Only a handful see it for what it really is—the strong horse that pulls the whole [church] cart.” If businesses go under because of milking ministries, churches go under, not to mention how many Biblical business practices which could help churches and ministries become better stewards of God’s resources. Highlight these church issues beyond the “Holy Hierarchies” of corporate and individual ministries concerning struggling businesses, and you’re met with spiritual Scrooges: Bah humbug! In Dickens’ story, Scrooge met the first of three Spirits, the Ghost of Christmas Past. It is here where we get a glimpse of Scrooge losing himself over time in his chase for gain and greed. Again Scrooge saw himself. He was older now; a man in the prime of life. His face had begun to wear the signs of care and avarice. He was not alone, but sat by the side of a fair young girl; in whose eyes there were tears. “It matters little,” she said softly. “To you, very little. Another idol has displaced me; a golden one. I have seen your nobler aspirations fall off, one by one, until the master passion, Gain, engrosses you. Our contract is an old one. It was made when we were both poor and content to be so, until, in good season we could improve our worldly fortune by our patient industry. With a full heart, for the love of him, you once were, I release you.” He was about to speak; but with her head turned away from him, she resumed. “May you be happy in the life you have chosen!” She left him and they parted. Like Israel had abandoned God for other idols in 1 Samuel 4-7, so did Scrooge abandon the love of a girl and chased the idol of the love of gold. His original generosity and kindness, now almost lost, would have given real help from his wealth to others…until…he had a wake-up call of his former self and had a repentant desire for a second chance to make amends for his avarice ways. Like Christmas, building up businesses is not a one-time act, but needs to be ongoing. But wakeup calls are not just about repenting and doing 180-degree turnarounds like Israel or Scrooge. In startup parlance, it includes pivoting your current direction to catch more Godly winds. In Dickens’ parlance, “Scrooge was better than his word.” For the church, it’s to catch the better winds of God’s will for marketplace ministries, and “honor Christmas in my heart, keep it all the year” for all levels of businesses throughout the year.